Featuring a pure vegetarian restaurant, Hotel Kamala is roughly 3 km from Indira Gandhi Park and 2 km from Bhubaneswar Railway Station. The property in Bhubaneshwar is a budget property offering a comfortable stay to its patrons.With its 20 well-kept rooms to choose from that are spread over two floors, the property in Bhubaneshwar offers a comfortable stay. 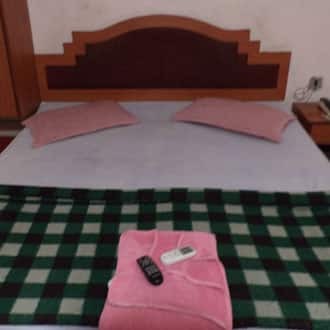 A host of convenience available in the rooms include television, ceiling fan, separate seating area, drinking water, and attached bathroom.Apart from good accommodation in Bhubaneshwar, the property is inclusive of car parking and front desk. Guests are offered housekeeping, travel assistance, and medical aid during their stay. Nearby points of interest to drop by are Nandan Kanan Botanical Garden (18 km) and Chandaka Forest Elephant Sanctuary (25 km). Hotel Kamala is accessible from DTS Bus Stand (2 km) and Biju Patnaik International Airport (5 km). this hotel is average for stay. the hotel is conveniently located midest of the city. I visited the hotel and had a great time there. the hotel was very clean and staff very cooperative and friendly. Food was good. Overall a nice experience. Kamala Hotel is located near Old Station Bazaar. This place is very near the railway station and that is the main advantage of this hotel. The rates are reasonable and the facilities are as per the price. no water no clean bed rooms are dirty and unhigenic totally useless i dont know why others gave a good review i dont have any personal grudge towards this hotel but my experience was worst that is why i need to get out of hotel. Initially we had no plans of staying at Bhubaneshwar. But as the train was late for more than 12 hours, we needed some place to stay for the night. This hotel was very close to the rail station. The cheap rates yet all facilities required for staying 1 day was the main reason that we selected this hotel.